One of the most recent departures from the show has been that of Irri, the Dothraki handmaiden and companion to Daenerys Targaryen. Played by actress Amrita Acharia, Irri showed herself to be spirited and dutiful, and it seems that last trait may well have led to her character’s very unexpected death on the series. We had the opportunity to speak to Amrita about he role, what it was like to be involved in a production of this scale, the difficulties of acting when speaking an imaginary language, and the problem of being one of the Horse Lords but without ever riding a horse… ! Unlike most of our interviews, this one has been published at Suvudu, where I’ve contributed a number of reviews and articles related to Game of Thrones. So go ahead and read the interview! One of the key deviations from the novels this season is that Robb Stark, played by Scottish actor Richard Madden, will be followed in his journey through the narrative when the book pulled away and kept him in the background. In past interviews, the executive producers have said a large part of the reason was that they loved Madden and his presence on the show, and they wanted to see more of him. 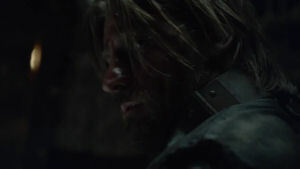 It’s difficult not to see their point: handsome, capable of playing stalwart and naive by turns, and charismatic, Madden draws the eye whenever he’s on screen portraying Eddard Stark’s son, who is now the King in the North. We had a chance to speak with Madden on the phone while he’s in L.A. doing the press thing, and decided to ask him questions (and, in one case, make a proposal) based on what fans submitted to us. See the results below! 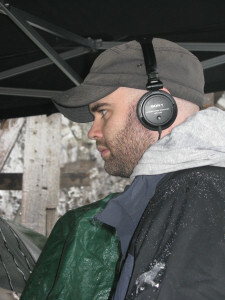 Almost a year ago, we first had a long chat with writer and keeper of the mythos, Bryan Cogman, about his role in the first season, which included writing the episode, “Cripples, Bastards, and Broken Things”. Bryan was there almost from the ground floor, helping during the time of the pilot, and becoming the right hand man to David and Dan as they developed, wrote, and produced the show. Going into the second season, he received the title of story editor… and he wrote the extremely well-received third episode of the series, “What is Dead May Never Die”. In the interview below, Bryan discusses various aspects of the episode, his overall role on the show, and more. Insightful as always! Well, it’s finally live: the last interview from our trip to the international press junket in London in late February, where we talk with executive producers David Benioff and Dan Weiss. I’d met David before when I visited the set back during the filming of the first season, and I’d spoken to the both of them during an interview around that time as well, but it was the first time meeting Dan… and yes, he’s just as much One Of Us as you can imagine, geek boys and girls; check out the question regarding the shirt he was wearing! Call me schizophrenic – I’m a guy of several different foci, usually in focus simultaneously. While mostly covering the gaming industry for several different sites (Gamasutra, IGN, Nintendojo, TotalPlayStation), I also write about the Wizarding World of Harry Potter at Universal Orlando Resort for Orlando Informer and found-footage films for Corona’s Coming Attractions and, but of course, George R.R. Martin’s A Song of Ice and Fire for Tower of the Hand. 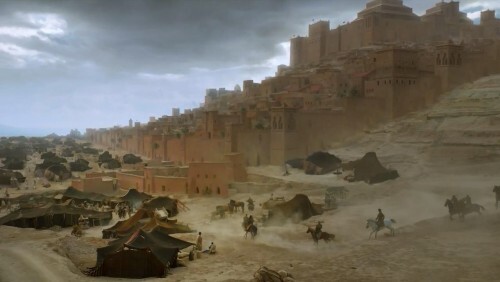 With season two of HBO’s Game of Thrones quickly approaching (in two weeks! ), it’s been mostly the last that has consumed my every waking thought. In between re-watching season one episodes, rereading chapters of A Clash of Kings, and publishing ebooks on the subject, I thought it might be fun – and, just possibly, instructive – to gather a chorus of experts to chat away on a slightly different perspective on Martin’s multimedia creation. The subject? Why, that one fundamental element absolutely crucial to each and every type of imagined world, whether it be physical or literary or, yes, digital: verisimilitude. Thanks to our friends over at Sky Altantic’s Thronecast after-show, we have another first look exclusive on longer interview segments they have up with members of the cast and crew. We’ve already posted their Benioff &Weiss and Dance interviews, so let’s close up with my favorite character: Catelyn Stark, and the actor who’s brought her to life, Michelle Fairley. You can read our own interview with Fairley here. Continuing our series of interviews from the press junket in London that we attended at the end of February—just one more left after this—is with one of the actors who has gotten the most attention from the success of Game of Thrones: Emilia Clarke, the actress who’s brought Daenerys Targaryen to life. She was as charming and cheerful as you can imagine, meeting with us and fielding questions about her work. Topics range from various aspects of her performance, her familiarity with the novels (on the face of it, she’s probably read them more times than I have! ), and a whole lot more. It was a pleasure speaking with her! Thronecast is almost upon us—following hard on the April 2nd premiere of Game of Thrones on Sky Atlantic in the UK—and they’ve kindly allowed us to have the exclusive first look at some of their interviews from the press junket. We’ve already posted the interview with David Benioff and Dan Weiss, but lets follow that up to revisit with Charles Dance, aka Lord Tywin Lannister, whom we have recently interviewed ourselves. You’ll get a bit more information… including spoilers, both for the first three novels in the series and for this season, so don’t play the video if that’s a problem! Continuing our series of interviews Ser Jaime Lannister, the Kingslayer. This is actually the third time we’ve interviewed Nikolaj—see here and here—and as always it’s a pleasure to hear from him. For other interviews, both from the junket and on other occasions, make sure to check this page out. Thanks to our friends over at Sky Atlantic’s Thronecast—where Linda and I will, indeed, be resuming our weekly presence!—we’ve received the opportunity to share Kelly-Anne Smith’s interview with executive producers David Benioff and Dan Weiss from the international press junket that we attened late in February. Here it is! Our own interview with the executive producers and lead writers will be going up tomorrow. Continuing our series of interviews from the international press junket—see here for those, and all of our season 1 interviews as well!—we had the chance to meet with and talk to actor Kit Harington about his role as Jon Snow. The young actor is definitely a favorite with some fans, and he discusses a bit of the fun fans have with the series, while sharing anecdotes from Iceland about the cold, fight scenes, and newcomer to the series Rose Leslie. 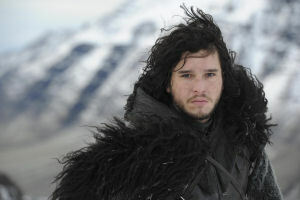 Plus some intriguing thoughts about what Jon Snow thinks about his mother, these days, as well as the benefits (and pitfalls!) of working in scenes that feature significant digital elements (i.e. direwolves). 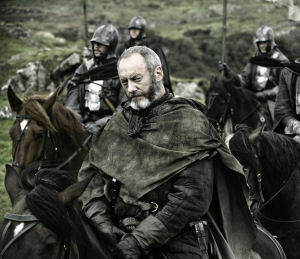 The fourth in our series of interviews from the international press junket Westeros.org attended last month (see our latest interview for links to all three earlier interviews), this time we’re touching on a brand new character to the series: Ser Davos Seaworth, the “Onion Knight” who faithfully serves Stannis Baratheon. Irish actor Liam Cunningham plays the role, and plays it well from what we’ve seen of the first four episodes, conveying Davos’s conviction in his loyalty to Stannis despite the odds against the eldest surviving Baratheon. In the interview below, Cunningham discussed his role, the contents of the pouch at his neck, who he’d love to see dub him in Brazil, and shows his true colors as a fan of the series with an insatiable appetite for more. If you’ve seen earlier interviews with Cunningham, you know he’s amusing, and he was very charming as he chatted with us! 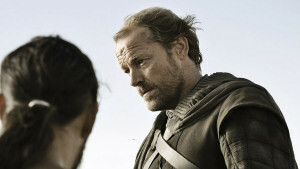 The third in our series of interview from the international press round table interview junket (see our previous two interviews: Charles Dance and Michelle Fairley), this time we’ll cross the narrow sea, through the tall grass of the Dothraki sea, and into the red waste and beyond to talk with Iain Glen, who plays Ser Jorah Mormont, Daenerys’s guardian, advisor, companion…. and perhaps a bit more. A Scottish actor gifted with a charm and a voice that apparently gets not a few hearts racing, Glen has done a bit of everything on stage and screen, including roles in blockbusters like Kingdom of Heaven and smash hits like Downton Abbey and, of course, HBO’s Game of Thrones. In the interview below, Glen discusses a range of topics: Jorah’s relationship to Daenerys, what we might expect over the next season, how it was to work in Dubrovnik, and more. Late last month, I had the privilege of attending the screening for international press of the first episode of the new season of Game of Thrones, “The North Remembers”. It was my first ever screening of anything—last season we received DVD screeners nearer to the premiere—and doubltess that added to my excitement when I saw it. Since then, we’ve had the opportunity to rewatch this episode and also see the next three episodes on screeners. Watching the sharply directed, beautifully shot first episode on a big screen, with a professional audio system in the screening room, was quite an experience, I have to say. It’s a show made for the big screen, to paint a lush image on that big canvas and fill your eyes with wonders. If HBO decided to premiere each new episode in cinemas in selected cities, I’m pretty sure they could sell out every single screening. Of course, part of the marketing promotion for the show entails early sneak peeks in theatres, so if you get wind of it taking place in an area where you reside, I really recommend trying to get in to one of those, if you can. This Q&A was released by HBO to help media provide coverage for the series. We’re providing here in full, so that fans can see it all. Some interesting bits in there. I do have to remark that for our part, as fans of the books first and foremost, “nice surprises” are the sort where you some grace note, some reference, some little scene or moment we love actually makes it onto the screen when all indications suggest otherwise. Possibly other book fans feel the same, and perhaps others genuinely want to be surprised by something new and different, but to each their own.